Veteran goalkeeper Essam El Hadary has been included in Egypt's final 23-man squad for the Africa Cup of Nations. 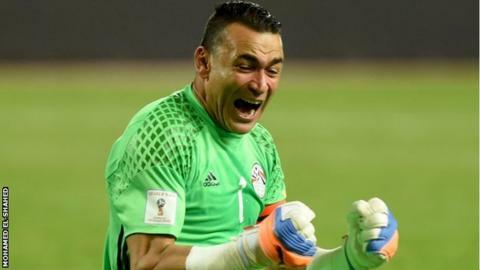 El Hadary turns 44 this month and could become the oldest player in Nations Cup history, beating the 2006 record of 39-year-old compatriot Hossam Hassan. Coach Hector Cuper trimmed four players from his provisional list. Al Masry defender Hamada Tolba and midfielder Ahmed Gomaa, Zamalek midfielder Mohamed Ibrahim and Ismaili goalkeeper Mohamed Awad were dropped. Last month, Cuper sprang a surprise by omitting Zamalek striker Bassem Morsi, who had been in the starting line-up for Egypt in their last two World Cup qualifiers in October and November. Only four of the squad remain from Egypt's last participation in the finals, when they won the title for the third time in a row in 2010. They are El Hadary, Ahmed Elmohamady, Mohamed Abdelshafi and Ahmed Fathi. Egypt, who have missed out on the last three Nations Cup tournaments, play in Group D in Port Gentil and open their campaign on 17 January against Mali. The tournament in Gabon runs from 14 January to 5 February. Forwards: Mahmoud Abdelmoneim Kahraba (Al Ahly Jeddah),Ahmed Hassan Kouka (Sporting Braga), Marwan Mohsen (Al Ahly),Mohamed Salah (Roma), Ramadan Sobhi (Stoke City).